Ratanpur is to be found 25 kilometres from Bilaspur on the Katghora Road. It is supposed to be the previous capital of the state of Chhattisgarh. Baba Bhairavnath Temple – Baba Bhairavnath temple houses a nine foot tall idol, located ahead of the Ratanpur palace. Apart from this, at the Ramketri palace a temple of Ram Panchayat also exists. Ekbira Temple – It is a temple dedicated to Goddess Lakshmi situated on a hill top. Buddheswar Shiv Temple – This Shiva temple was built by Bhimbhaji Bhonsle at the foothill of a mountain. Ratneshwar Mahadev temple – It is another Shiva temple in Ratanpur. 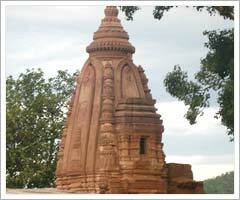 The Mahamaya Temple – This is an eleventh century temple constructed in the rule of Calturi, the ruler of Raja Ratnadev. There are numerous ponds found in the vicinity of the temple. A temple of Kantideval of the Maratha period is sited in front of the Mahamaya temple. The Old Fort – Among the ruins of this fort, there is a striking stone figurine over the frame of the Ganesh Gate. There are several other statuettes of Lord Brahma, Lord Vishnu and Lord Shiva in His Tandav dance pose. Inside the fort there are temples of Jagarnath and Sitchourai as well.